Samsung hits 10 million Smart TV app downloads | What Hi-Fi? Samsung has announced that its Samsung Apps store for Smart TV apps has hit 10 million downloads. After hitting five million app downloads in May earlier this year, the number of downloads has since doubled – and now averages 50,000 downloads per day. Video apps remained the most popular, with YouTube leading the way in terms of worldwide downloads. Other apps on Samsung's Smart TV service include BBC iPlayer, Acetrax, LoveFilm and Skype. Accessing smart TV apps requires that your TV is connected to the internet, either via a wired or wireless connection depending on the model. 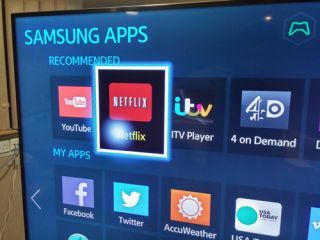 Guy Kinnell, marketing director for TV, Samsung UK, says: "“Over the coming months, we will continue to seek partnerships with content providers to provide a vast range of apps so people will not only find an abundance of entertainment choices on their Smart TV but lifestyle too."